It's been about six months since Bennett was last in the hospital. So, I thought I'd provide an update on how he is doing health wise. Overall the report is that he is doing very very well. Bennett's bowel issues resolved completely. It's as though nothing ever happened. In addition, Bennett's appetite and energy are very good and he feels and looks great! To my surprise, Bennett's PFTs (pulmonary lung function test) was lower than usual (at 89% versus 100%), which was mildly concerning. He is showing no respiratory symptoms and his lungs sound clear but a chest X-ray shows some inflammation in his lungs typical of CF. So, Bennett's pulmonologist believes his lower lung capacity numbers is likely due to an overgrowth of MSSA (Methicillin-Sensitive Staphylococcus Areus). MSSA, which is tremendously common in the lungs of those with CF, doesn't typically cause symptoms...but it can. So, Bennett will go on a round of oral antibiotics in hopes we can get it under control. We will come back in 3 months as planned and retest his PFT to see if oral antibiotics have made any improvement. Our GI doctor is still very anxious to get Bennett's weight up for fear his low weight is stunting his height. Although Bennett did gain 2 pounds in the last 3 months, we need him to gain another 8-10 pounds. I will continue trying to get him tube-fed at home more often. Night-time feeds have become completely disruptive to Bennett and my sleep so now we're looking to maximize his day-time feeds, which is hard when he prefers to eat by mouth. I feel like Bennett is always either eating or doing treatments. Nonetheless, we'll find a way. One thing I want to brag on our CF clinic for that I learned about during this most recent visit is the addition of a Physical Therapist to our team. I am super excited about the addition of a Physical Therapist to our CF team because she will be particularly mindful of ways of incorporating exercise and physical therapy in Bennett's care, something the CF community has known anecdotally benefits those with CF and now are starting to have research to back up. 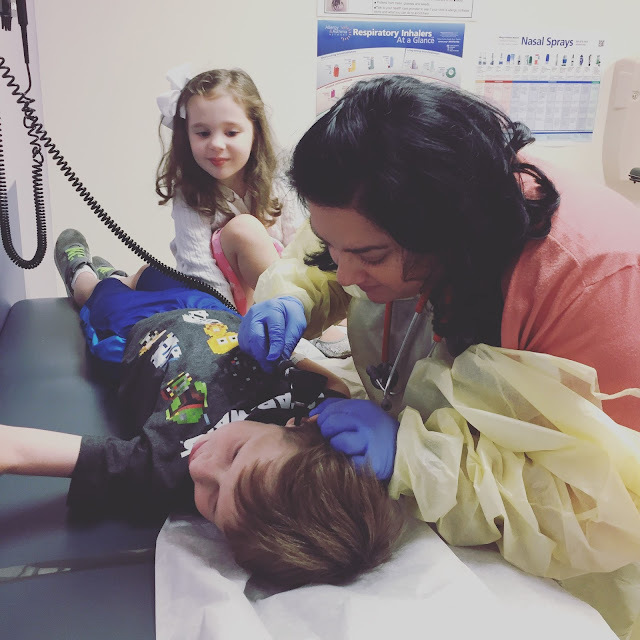 At our next CF visit in November, Bennett will undergo a DEXA bone scan (something the CFF recommends starting at age 8). I suspect the scan will show osteoporosis or something similar due to his being chronically underweight and having a lifetime of GI issues. If the scan does show lack of strong bones, we'll continue to find ways to improve his nutritional status and likely begin a Physical Therapy routine at home or outpatient to maximize his current bone and muscular structure as well as lung health. So much of CF care right now is preventative and proactive in anticipation of deteriorating lung health, most active in adulthood. I am so so very hopeful that in a few years Bennett can get a medication that will slow down this lung deterioration process and give us some more time. It's so hard to consistently worry about Bennett's health, even when he's doing really really well. Long time reader, and aunt to a 7 yo nephew with CF. I am really curious about the weight gain issue. From day one the docs have put soooo much pressure on my sister to work on weight gain. Understandably, but my nephew has always weighed more and been a little meatier than my own non-CF 7 yo boy. Is it a body fat thing, a nutrition thing (with all the absorption issues), a muscle mass issue? Now all the sudden I am worrying that my super skinny kids are at risk of not growing to their full height potential, even though we get as much good food in them as possible. I guess I wonder if the docs push the weight with CFers from the start just because it is such a problem for a lot of CFers? Is there no room for there just being different body types? Hi Kiara, I wrote this long response to your great questions and then it didn't post! Ha! So, let's try this again. You ask a great question: "Is it a body fat thing, a nutrition thing (with all the absorption issues), a muscle mass issue?" I will tell you it's all of the above but ultimately a nutrition thing. In general, weight in children demonstrates good nutrition. And, there are CF studies that show that children with BMI above 50th percentile do better with their lung health. Is that because they are already healthier or is it because weight matters? We probably don't fully know why but we do know weight and lung health are correlated. That's why there's such a push moving the weight of children with CF as close to the 50th percentile as possible. You mentioned that you wondered if "the docs push the weight with CFers from the start just because it is such a problem for a lot of CFers"? The answer is yes. CFers don't digest their food efficiently so they need about 100% more in consumed fat/calories as their non-CF peers. You asked, "Is there no room for there just being different body types?" There is and our own doctor is aware that Bennett may always be on the slender side. But, we know that chronic lung infections (something CFers have all of their life) take additional energy from the body and we know that ppl with CF don't efficiently break down their food to use that energy well. So, for that reason, in the CF community, increased food consumption and weight gain is imperative. It is my understanding that all children should eat well which includes a well-rounded high-fat, high-calorie diet as they are growing rapidly, especially their brains. But I do not believe there are as dire of consequences if this doesn't happen. We also see that despite our best efforts, many kids with CF end up needing g-tubes and supplemental nutrition to get to the 50th percentile. Children without CF don't typically need that much intervention. 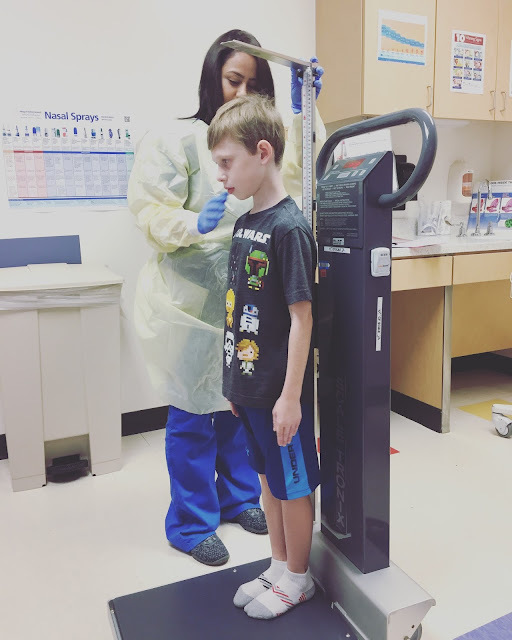 I believe that while some kids with CF may be initially meatier and may have more weight than other non-CF children their age, their weight begins to suffer once they undergo lung infections. So, childhood really is a bit like an insurance policy for the future. Hope this helps!! Those little simmering worries that 'must' take a toll you in one way or another...Thinking of you all. Thandi, thank you for your sweet comment. You are on point. It does take a toll. Thank you for thinking of us. Hi Dear, as I came across your post and reading this I am tearful and crying and amaze at what a good and strong mother you are. Many blessing to your and your family hope there will be many many good news in your upcoming posts. I was reading on rectal prolapse on kids as my 5.5 year old is dealing with it and I came across your site, my son was tested for CF and other blood work and it came normal so he has been put on Maralax for the past 2 months, this happened only once last year that scared us to death first week of toilet training at 4.5 and I put him back on diaper and gave maralax for 7 months, this year given a year had gone by wishfully thinking I can resume the toilet training and it seems to have to come back I have gone to 3 GI and in his case this year I have seen it happen 11 imes in about 3 months, so far I have only notice this happening at the end of his stool when he tries to go for a last push(he is not constipated but some times it seems like if the stool is not watery enough he wants to do a last strain) and I see it poking through and as soon as I asked him honey I think you are done, when he stops it goes back up. it has been so scary and so worry some, I fear the worse and I cry a lot. Drs told me to keep the stool soft and wait and hopefully it will grow out. I am wondering if you can provide me a bit more info on the rectal prolapse you experienced with your son, I know the cause are different but I am wondering why a decision to do surgery was made? how big the prolapse where for him and did they go back up on their own at first.. I wish you and any mother who is going through health issues with their kids the very best, I feel like these days life so so cruel and unfair. Prayers and positive thoughts your way. Hi Dear, as I was reading your post I could not help not to cry, I am sorry for the hard time you had to go through with your son health issues, but you are such a courage and strong mom and u give me hope and courage to be a better mom to my son. I came across your site as I was searching on rectal prolapse as my 5.5 yr old is going through it since sept. it first happen a year ago at 4.5 when I wanted to toilet train him for #2 on adult size potty, took him to GI immediately and they calmed me down, asked me to give him Maralax. I did for 7 months and put him back in diaper as I was scared. a year later at 5.5 we tired adult size toilet with one of those steps and seat together, and since then we have seen it come about 11 months in the past 3 months...even though we put him back on Maralax and took him to GI. we have done the CF and other blood work that came normal, I am so scared worked and depressed, I do not know if he will grow out of it like they say or may continute to have this issue. in his case this year they seems to occur at the end of his poop when he tries to do a last strain if it happens(he is not constipated but I think he probably needs to be a bit more softer) they seems to come out as he does a strain and I have to tell him honey I think you are done and when he stops it goes back up that second so far. I was wondering why the decision to operate on your son was made vs waiting and keeping the stool softer? how long was the prolapse going on before surgery and what size were they(were they more than 2 cm?) thank you for any info you can provide me with and wish you all the best in the world not only you are great mom but you are a strong person and thanks for sharing your story.